A shock declaration by the UK Prime Minister could spell the end to the Brexit deadlock. 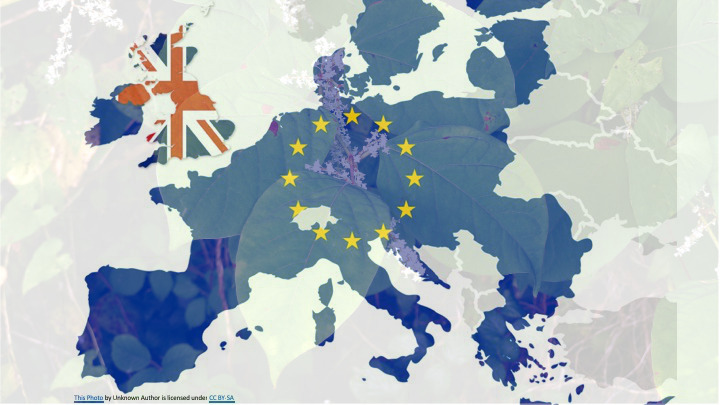 Britain could be forced to back down on its plans to leave the Union due to its position being made untenable from its responsibilities for releasing Japanese knotweed across Europe. (previous shots across the Brexit bow were fired last year: Brexit may bring new invasive species to UK risking economic damage, say experts). The alarm was sounded late Friday afternoon as Donald Tusk submitted papers to Number 10 indicating that a class action formed of EU Member States was being assembled ready to be served should the UK’s plans to leave the Union not change before the 12thApril deadline. Europe is holding the UK responsible for causing the huge infestation of Japanese knotweed that has spread across the continent from the initial UK introductions in the late 1800s. There is little defence to this claim as numerous scientific papers cite the foundation of the UK knotweed population beginning at several botanic gardens in England and Wales following the antics of Victorian botanists who had then returned from their plant-collecting exploits in the orient. The issue will be discussed at the meeting of MPs that is due to take place later today to see if an alternative Brexit plan can be agreed. Unless this includes a plan to drop Brexit entirely, the UK could be facing the risk of bankrupting itself, which the Government is unlikely to allow. As such, there could be no alternative, and Japanese knotweed “May” well be the undoing of Brexit.